Vouchers provide a straightforward and cost effective solution for users to upgrade their account balance. Vouchers are common value tokens in many applications, like for instance pre-paid mobile phones. Unlike solutions that use smart cards, micro-payments or vending machines, voucher systems require no hardware investment. While manual processing is needed to generate, print, distribute and sell the voucher cards, redemption is fully end-user driven and can be processed automatically. 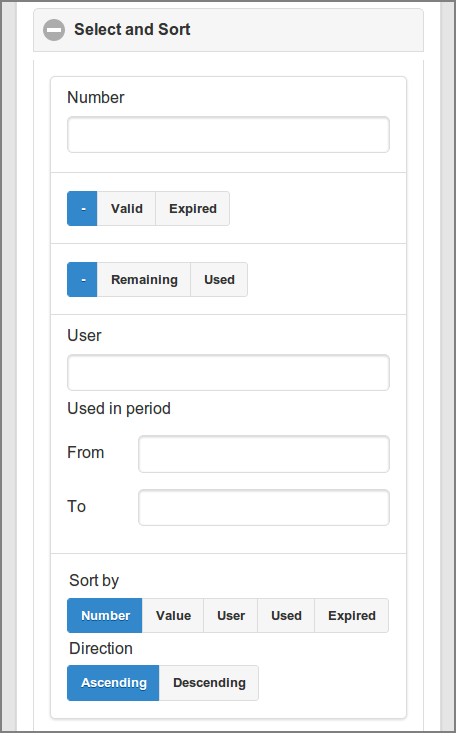 A Web App dialog for administrators to Create Vouchers. A Web App dialog for end-users to Redeem Vouchers. A Voucher Security safety net for voucher tracking and fraud prevention. The list shows the vouchers of a selected Batch-ID and the extra selections shown in the next figure. The list is refreshed, and the selection applied, after you push the Apply button. The Default button resets the selection items to their default values. Their Valid or Expired status. Their Remaining or Used status. Part of the User ID that redeemed any voucher. The From and To date of their usage period. Due to Admin Privileges this section might not be visible. New: pops up the dialog to Create Vouchers. Delete expired: deletes vouchers whose expiry date is before the current date (today). Expire: Expires all remaining vouchers of the selected Batch-ID by setting the expiry date to today 00:00. Delete: Deletes all remaining vouchers of the selected Batch-ID. 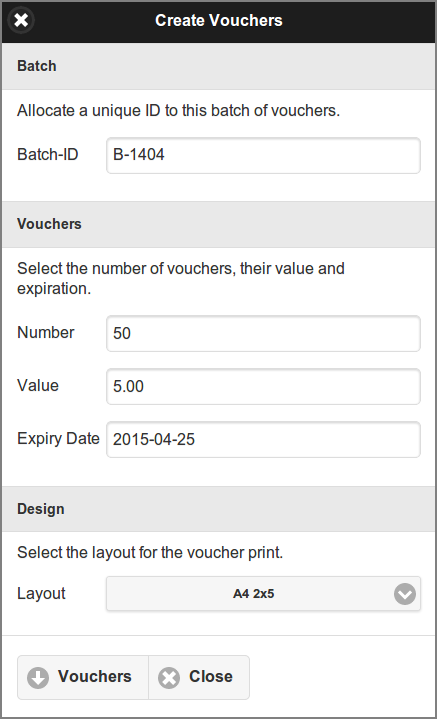 Vouchers: downloads a printable PDF document with remaining (non-redeemed) vouchers of the selected Batch-ID according to the selected Layout. 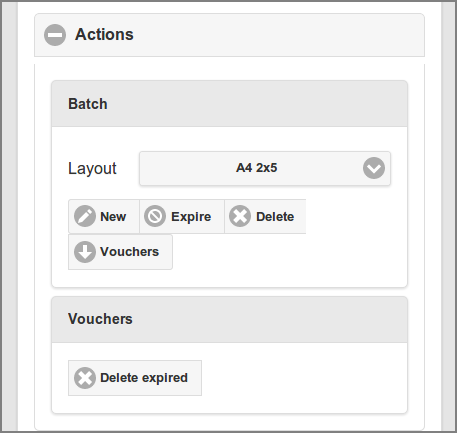 Batch-ID: a user defined ID that will be assigned to all vouchers in a batch. The ID is prefixed to each voucher number to easily identify its source. A unique ID should be assigned to each batch. Number: the number of vouchers in the batch. Value: the monetary value of each voucher. Expiry Date: the date after which a voucher can no longer be used. This enforces that vouchers are valid for a limited period of time. Layout: the page format of the PDF output with the number of voucher columns and rows. Some fixed variants are offered. 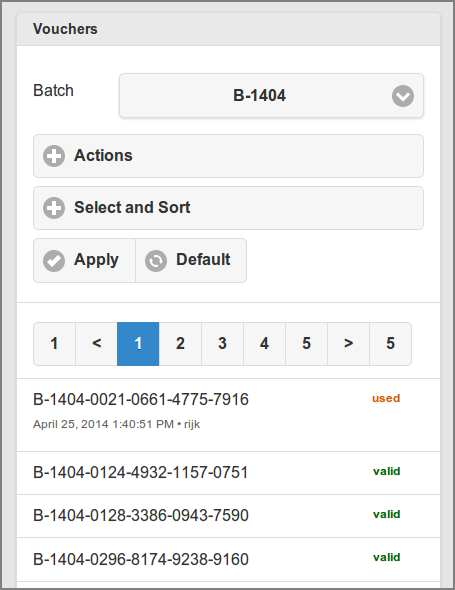 Each voucher in the batch is assigned a formatted random unique number, for example B-1404-0021-0661-4775-7916, and is stored in the database. A printable PDF document is downloaded with all vouchers from the batch according to the selected Layout. This is what end-users should know about vouchers. Purchase a voucher from an authorized person at an assigned location. Vouchers are unique for your organization and cannot be used elsewhere. Use a web browser to open the SavaPage User Web App. After logging in, your current account balance is shown at the footer bar. Push the account balance button to pop-up the User Details dialog, and push the Redeem Voucher button in the pop-up. Enter the voucher Number in the next dialog box and press Redeem. Make sure to enter the number exactly as listed on the voucher including any dashes (-). If you entered the number correctly, the value as shown on the voucher will be transferred to your account and a new entry will list in your transaction log.